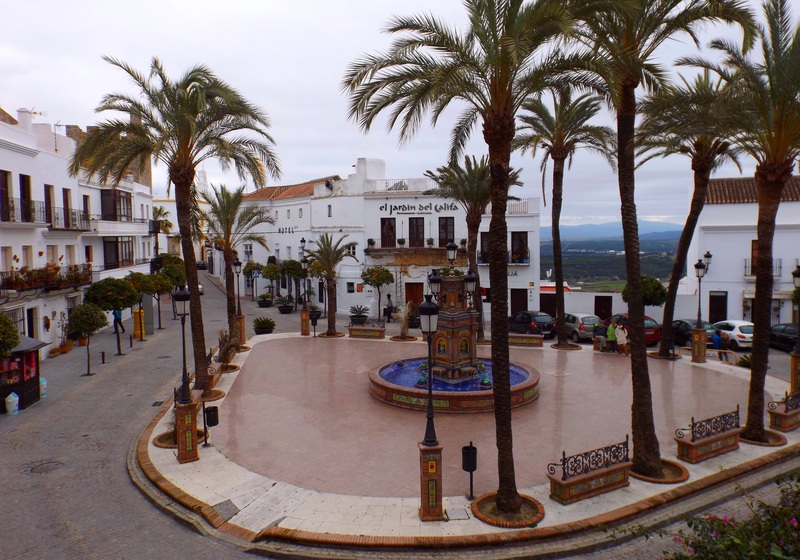 After a great week cruising around with Mother and Father Pollard in their motorhome, we moved on to our next workaway, close to a village called Vejer de la Frontera in Cádiz province. Our hosts were an amazing English couple – Chris and Jo – who have been living and working in Spain since the 90s. 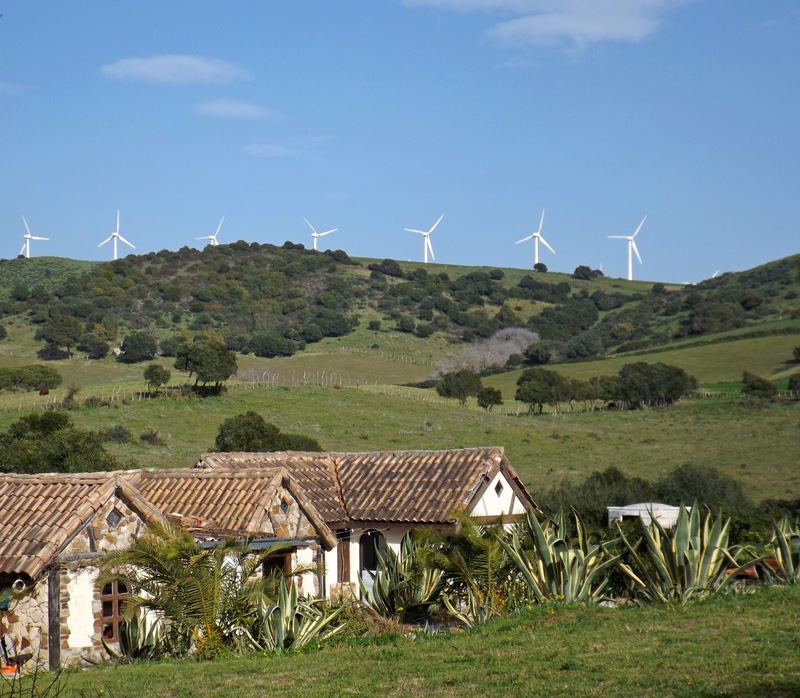 Their home, which is around 4km from Vejer, consists of a colourful house, a large garden and vegetable patch, a yurt, an adjoining studio (which is rented out to holidaymakers over the summer), two caravans and a pond. Another volunteer named Mandy arrived late on our first evening. She’d had a pretty hellish journey as her ferry from England to Santander had been cancelled and delayed several times due to snow. When she was finally able to catch a ferry over to northern Spain she ended up stuck in a huge blizzard in her car. Ultimately the road had to be closed, which left her and many others stranded. She had to abandon the car where it was and luckily managed to catch a lift from a Spanish man with a 4-wheel drive, which was one of the few cars able to drive in the heavy snow. 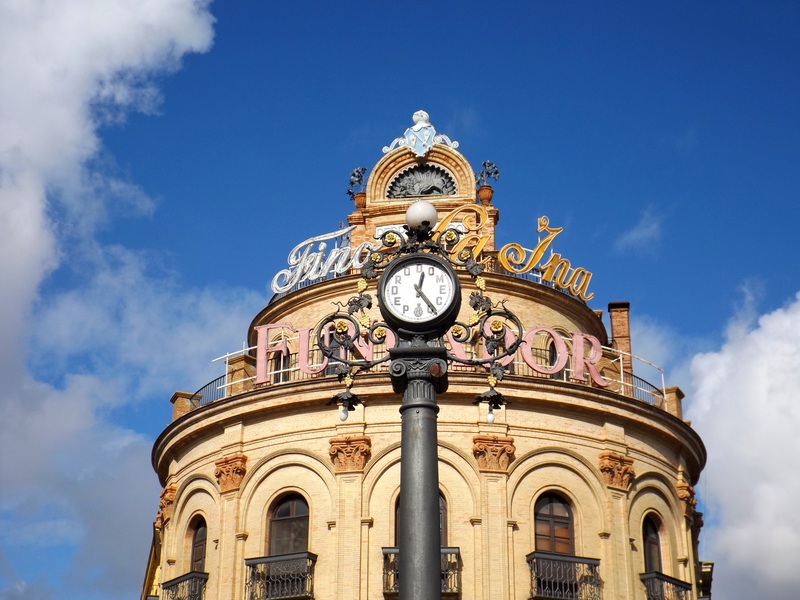 She spent a few days in a hotel before the road was finally cleared and she was able to return to her car and start on the 10-hour journey through Spain down to Vejer de la Frontera! As Mandy is an experienced gardener she spent a lot of her volunteering time weeding and planting in the garden. That left me to help out with various domestic tasks – cleaning, baking and cooking – while Phil helped Chris out with a lot of outdoors (read: MAN) work. Jo grows a lot of her own vegetables out in her veg patch, meaning I was able to cook meals using fresh ingredients. Pumpkin and sage risotto was a particular favourite. The fact that both the pumpkin and sage were home-grown certainly seemed to add to the taste, or at least the satisfaction of cooking and eating! Vejer de la Frontera is an hour’s walk away from Chris and Jo’s property, but we had a couple of chances to visit during that first week. The village is stunning both for its hill-top location and its purely white buildings, so it’s a nice place to wander around. On the first Friday Chris and Jo took us into Tarifa, the southern-most city in mainland Europe as they were attending a singing group there in the evening. That gave us time to enjoy the old historic quarter of the town, but the most stunning aspect of the place had to be the tremendous views out to Morocco. I’m not sure of the exact distance, but various websites of varying reliability inform me that Morocco is less than 20 miles away from Tarifa. Certainly from where we were standing it hardly seemed like a stone’s throw away. 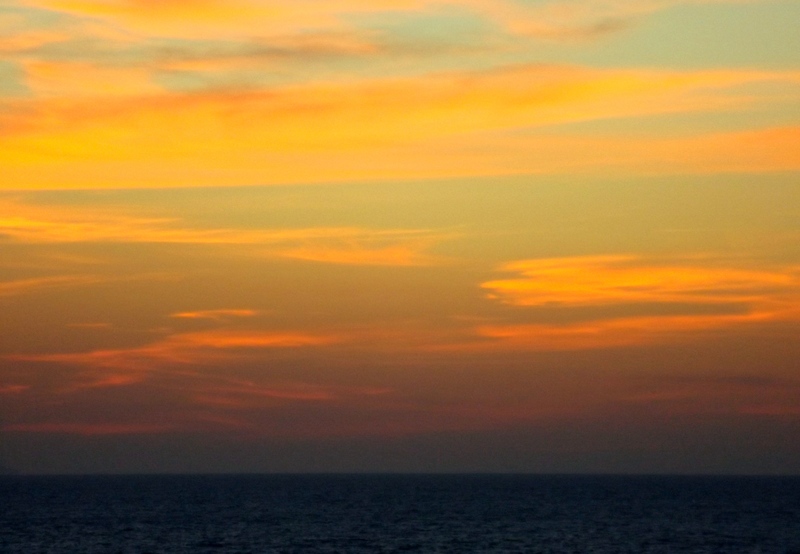 Watching Morocco begin to light up in the early evening was fantastic, and the sunset was spectacular too, so we stood out and enjoyed that for a long time. As is always the case, photos can never do the actual scene justice, but I took a couple of photos anyway. On the first weekend I decided to head back to Cádiz where my parents were spending the weekend, because I wanted to surprise my mum whose 60th birthday was the following week. Dad and I had conspired together so he knew the plan, but the total shock on mum’s face when she was me was priceless. 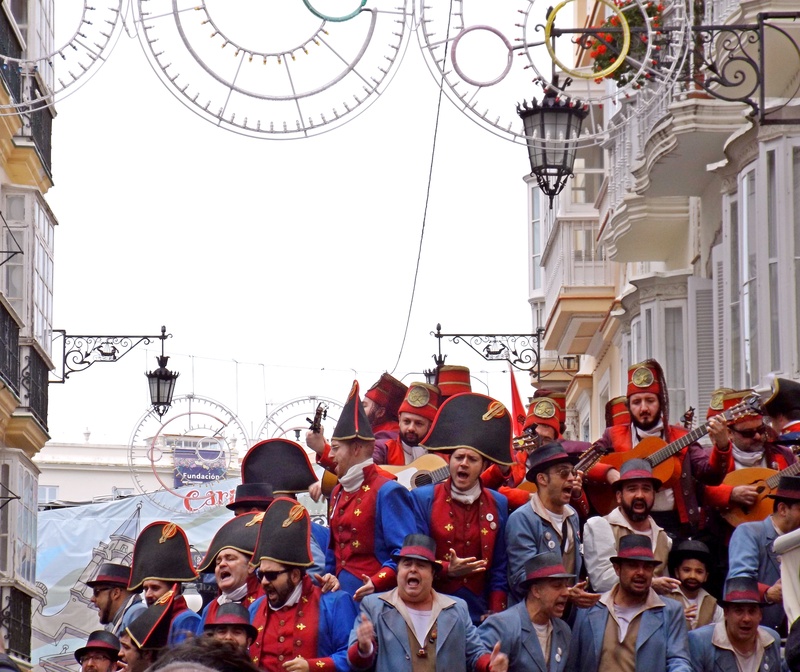 There’s a huge annual carnival in Cádiz, and it started on the weekend that we were there. Chris and Jo had told me about the carnival – which is reputedly the third largest in the world after Rio and Trinidad – but nothing can quite prepare you. It is so far from anything you’d find in England; families, kids, youths and adults all dress up in coordinated costumes – you’ll bump into random bands of bumblebees, pirates and nuns throughout your time there – which is fun enough by itself as everyone is out drinking, eating and enjoying the street markets, but the main draw of the carnival are the singing groups which burst into song in the streets. 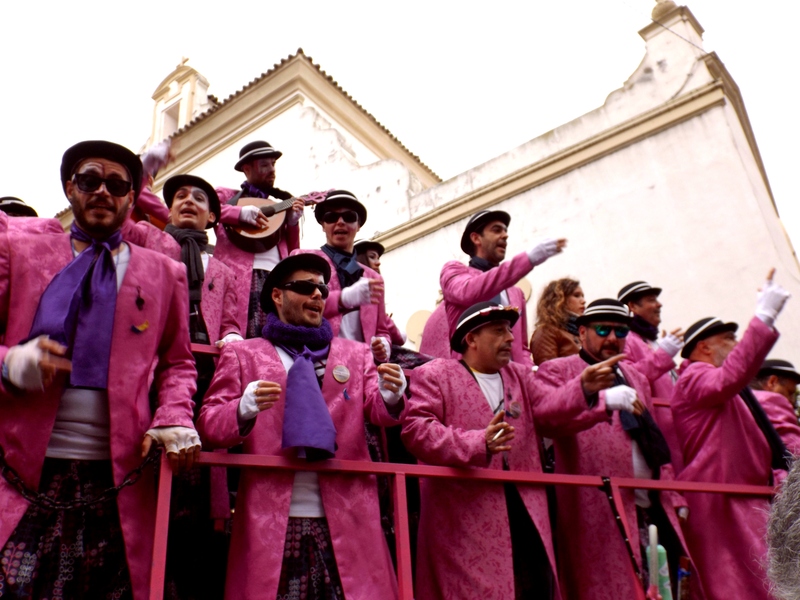 Some of these are professional singers (in family groups, choirs or quartets) as there is an official competition each year just prior to the carnival where the best groups are chosen, but there are also plenty of ‘ileganos’, which don’t take part in the actual competition but will still be heard belting out songs together throughout the carnival too. We spent two very enjoyable days just wandering through the busy streets and taking in the sights and sounds. The singing groups themselves were incredible – obviously the satire was lost on us given that we’re not familiar enough with the language – but there were some incredibly talented singers, and the passion and conviction with which they sung made it all the more compelling. Although there were plenty of female groups and mixed groups, we noted that there seemed to be even more groups of male singers, often ranging from guys in their 20s to guys in their 50s. This struck us because it’s not something you’d expect in England; singing your heart out with a group of guys your parents’ age would be considered pretty uncool amongst younger people. Sunday afternoon, it must be said, was beyond busy and bordering on jam-packed, and our quest for lunchtime tapas before I caught the bus back to Vejer became a slightly panicked ordeal as every café, bar and restaurant was full to bursting point. In the end we found ourselves ordering chips and a burger from a fast-food place, which in itself was so busy that it took half an hour to get our food. We munched this down unceremoniously before rushing to the bus stop and saying our goodbyes. 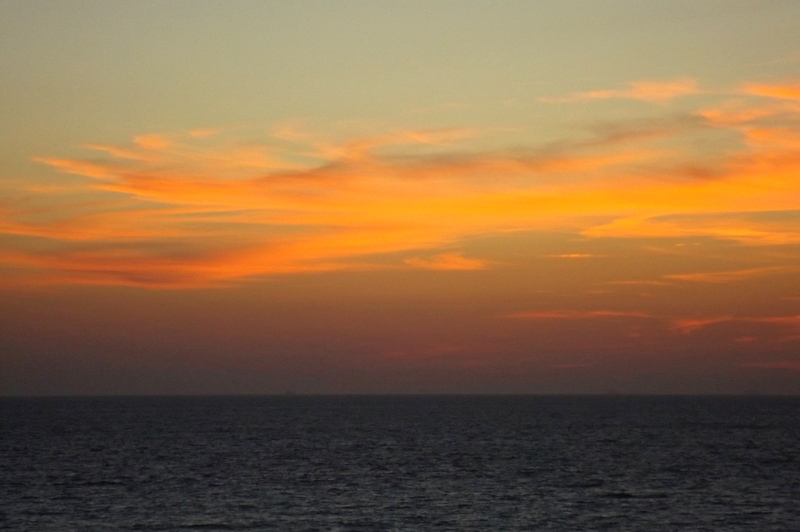 The next week passed in a similar fashion to the first. We both felt totally at home at Chris and Jo’s place, which is a testament both to their warm and welcoming nature as well as the lush beauty of their property and the whole of the surrounding countryside. They had two more guests staying with them for a week – Sharon and Sue – so we moved out of the studio and into the yurt so that they could stay in the studio. On the Friday we all went out into Vejer for drinks and tapas and had a nice walking tour from Chris and Jo who showed us some of the nicest sights around the centre. On Saturday me, Phil and Mandy went to Jerez – a city just north of Cádiz which is famous for its sherry. There was a flamenco festival on in Jerez (we’re starting to get used to the large number of festivals that occur throughout Spain! ), so we set off in search of some free flamenco. Most of the main shows you need to book in advance and take place late in the evening, but we were lucky enough to stumble across a cosy little sherry bar which had a flamenco singer and guitarist set to play at 1.30pm. As you’d expect, it was closer to 2.15pm by the time they took to the stage, and Phil was starting to get just a little bit fidgety by that time. Nevertheless, we set ourselves up with some wine, sherry and tapas and waited dutifully. It was absolutely worth the wait. The power of the flamenco singing, coupled with the gorgeous guitar, is totally mesmerising. 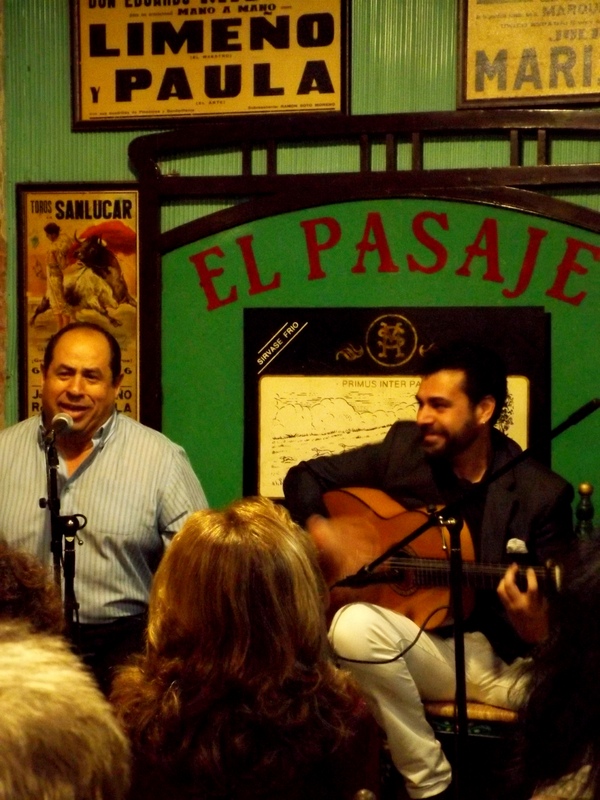 Later in the day we found some more free flamenco, this time in a lively bar where a singer and guitarist were crammed into a corner to make space for everyone to dance. There were no other tourists in the bar but the atmosphere was still very warm and inclusive; one group of locals got us three up and dancing with them for a few songs which was great fun, despite our total lack of flamenco knowledge! 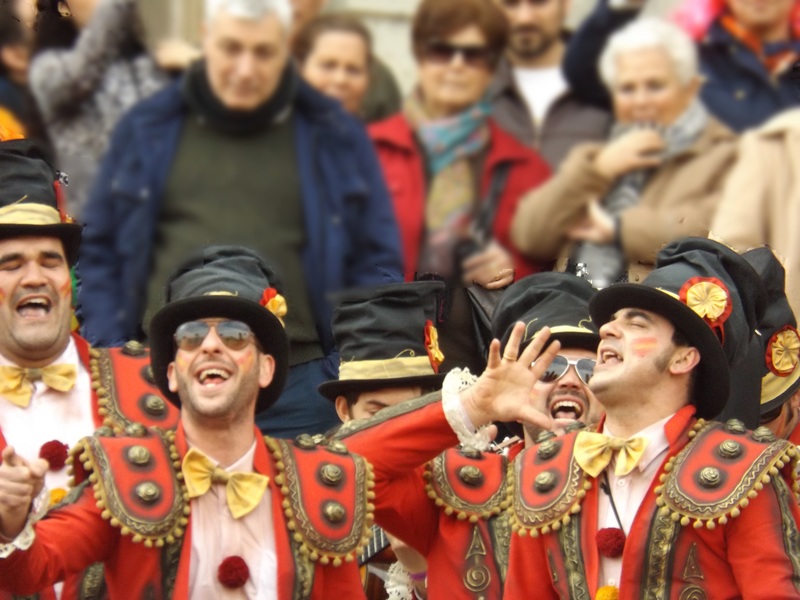 The carnival which has its peak in Cádiz also spreads out across other towns in the area, and on the Sunday a nearby town on the coast called Barbate was holding its version of the carnival. This comes nowhere near the vibrancy and intensity of the carnival in Cádiz, but Sharon and Sue kindly took me and Phil there so that we could see the town, the beach and enjoy the festivities. For a reasonably small place the parade which went through the streets seemed fairly big, and the kids on the floats seemed to have a good time chucking confetti at everyone as they passed. Afterwards we headed out for some drinks and tapas along the beach, and tried some smoked tuna given that tuna is a specialty in the area. Even Phil who isn’t necessarily the biggest fish-lover said it was nice, so that’s a thumbs up from us on the smoked tuna. There is an amazing yoga and meditation class every Wednesday which takes place in the yurt. The class is taught by Andrew, a guy who lives locally and who is good friends with Chris and Jo. He’s originally from the US so he very kindly gave the classes in both Spanish and English so that Phil and I could understand. We’d been staying in the yurt for about a week whilst Sharon and Sue were staying, but they left on the Tuesday and so we moved into the guestroom in the house so that the yurt was clear for the class. One of the final tasks which Chris and Jo needed our help with was painting the studio, so this gave us space and time to clear out the studio and give it a good clean and paint before Phil and I left for our next workaway. The last guest to arrive was a workawayer-turned-friend, Paul, who comes from Ireland but has been living and working in Spain on and off for over 10 years. On our final weekend at Chris and Jo’s, we had a couple of evenings out for drinks and tapas with Paul; first to Tarifa on the Friday and then to Jerez on Saturday. Chris and Jo were meeting some friends on the Saturday to see a professional flamenco show and generously gave us all a lift so that we could have another evening to enjoy the cafes and bars in Jerez given that we’d enjoyed it so much on the first visit. And thus we came to the end of our time with Chris and Jo. It felt very sad to leave – over the three weeks spent with them we’d met some amazing people (not least the hosts themselves! ), visited some fantastic towns and cities, had some delicious fresh food and done work that we both enjoyed. 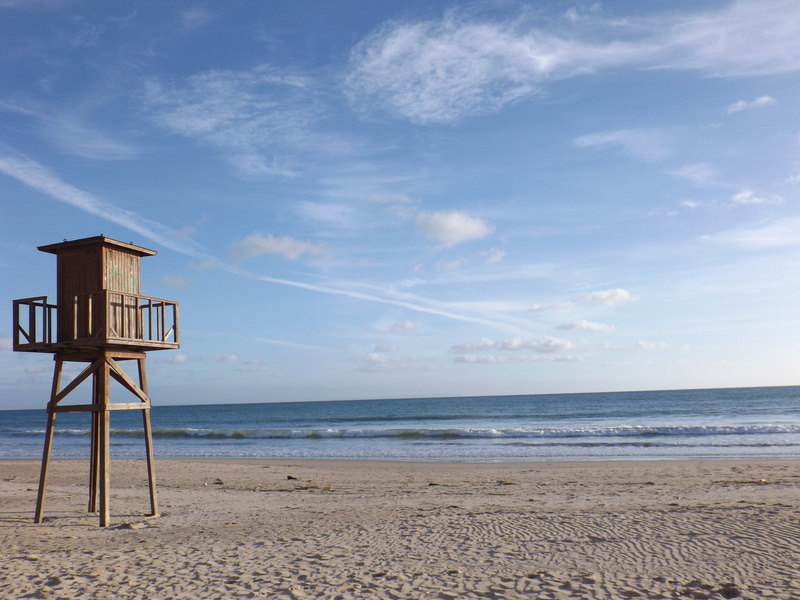 Of course, we were also looking forward to our next workaway experience which was with a lady called Julie in Algodonales, a village just north of a large natural park in Andalucía. That will be covered in the next blog post, so until then thanks very much for reading!